In the twenty-first century, the notion of colonial empires has a distinctly antiquarian feel. Yet the British Empire, one of the most successful, exists to this day albeit in a composite rump-like form. 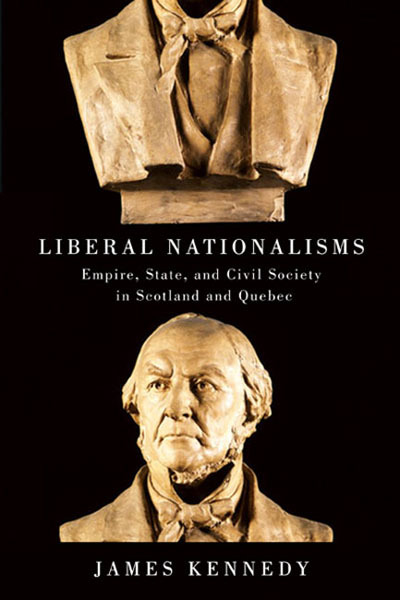 At its height, the global reach of the British Empire was equalled by the wide range of political culture within it, and this variation, alongside the complex colonial relationship between ‘core’ and ‘periphery’ informs James Kennedy’s Liberal Nationalisms: Empire, State, and Civil Society in Scotland and Quebec. Kennedy provides a comparative history of nationalism and nationalist movements, through the respective histories of the Young Scots Society (YSS) and the Ligue nationaliste canadienne (LNC) between 1899 and 1914 relative to the multi-faceted ideological dynamics of the British Empire and Canadian Confederation. The book examines the divergent historical and political context within which the YSS and the LNC operated. Their different methods of political organisation and activity are related in an interesting, thought-provoking way. By embracing a more interventionist form of liberalism, both groups were fundamentally informed by ‘state-reforming’ nationalism rather than separation and independence. The YSS was associated with Liberal politics, and propagated a progressive ideology of improvement based on education and knowledge. It aimed to build a mass movement, and was aided by an ideological shift from traditional liberal concerns to a more radical social policy agenda, alongside Scottish Home Rule. By contrast, the LNC, pursuing greater autonomy relative to Canada’s provincial and federal powers, was independent of existing political parties and viewed its primary mission as educational. Avoiding grass-roots organisation, the LNC relied on persuading ‘men of influence’ through the press, publications, and speeches. Kennedy outlines three substantive areas, Empire, State, and Civil Society, as a means of demonstrating the contours of the identity politics these movements represented. Historical parallels between Scotland and Quebec are drawn, with particular importance attributed to the respective institutional props which provided the basis for nationalism to develop. For Scotland, the 1707 Union with England left many Scottish institutions untouched, while Canadian Confederation was unable to curb, and in many ways fuelled French Canadians’ desire for autonomy based on language and religion. As ‘state-reforming’ nationalists, French Canadian ‘bi-nationalism’ and Scottish ‘Home Rule’ sought not independence but intermediate constitutional solutions. In opposing ‘separatism’ the YSS and LNC both insisted on attachment to larger constitutional entities. Kennedy relates well how this conception of nationalism was tested under the stress of the Boer War. In Britain, the war boosted support for Scottish Home Rule as part of ‘Home Rule all-round’ federalism, while a degree of French Canadian sympathy for the Boers was evident. French Canadian loyalty and attachment was exclusively to Canada and not Britain. While loyalties were tested by Britain’s imperial wars, the wider resonance of bi-nationalism remained powerful and influential especially in relation to the development of the western provinces. While the survival of French Canada was the LNC’s primary concern, bi-nationalism was promoted as integral to the survival of Canada itself, with French influence a counterpoise to the danger of American influence and annexation. Thus, ‘dualism’, equality and not cultural assimilation or separation, between Canada’s two national groupings, became a fundamental principle of the LNC. Interestingly, Scottish Home Rule was also advanced as a means of providing greater legitimacy and loyalty to the UK’s pre-existing constitutional arrangements. The British unitary state and the Canadian federal state were products of political settlements that accommodated minority nations through a broad federalism. The pan-Canadianism of the LNC and the Home Rule creed of the YSS both reflected a belief in liberal reform within larger constitutional constructs. The efforts of the pre-1914 movements were directed at attaining a higher degree of cultural and political accommodation. The First World War largely destroyed this model of national grouping. After 1918 Quebec-based movements assumed a more advanced position, most notably in the Parti Québécois notion of ‘sovereignty association’. For the YSS, the rise of the Labour Party, extensive welfare reform, and administrative devolution after 1918 effectively undermined the case for Scottish Home Rule for a generation. The book ends by demonstrating that the respective influence of the YSS and LNC, while important, was neither direct nor immediate. Nevertheless, the contemporary relevance of the work, evidenced by the 1995 and 2014 referendums in Quebec and Scotland, is clear to see. Kennedy does well to identify the intellectual antecedents of the range of constitutional arrangements, proposals, experiments, and expedients which have been made, short of full independence. Equally, while arguments for national independence have gained significant traction in recent years they have met dogged resistance from pre-existing alternative modes of constitutional and political authority, organisation, and identity. Comparative history is always fraught with the prospect of making tenuous connections and glib comparisons. In largely avoiding these pitfalls Kennedy has written an impressive book. While the author acknowledges differences between the movements, he often appears to be searching for points of similarity, and for the heightened relevance of particular issues, which demonstrate his comparative analysis, often when the evidence will not fully support the contention. Nevertheless, in the main this is a very accessible, well-researched and scholarly work. Dr. Gordon Bannerman is currently a research assistant at the London School of Economics and a tutor with International Correspondence Schools.